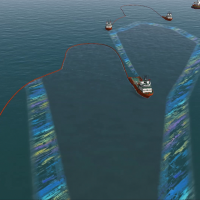 The Oil Spill Response simulator enables crew training in vessel and equipment handling during oil spill response operations. The command centre personnel can use the system for resource management training, including resource cost calculation. One of the added values of the Transas oil spill response training solution is a common environment and other capabilities to enable joint training of various parties involved in oil spill response operation, such as bridge and deck teams and shore personnel. PISCES II resource management simulator. Controlling oil booms, skimmers, busters and oil barges. The modelling of response objects such as booms and busters is based on the manufacturers’ equipment data. Speed and sea state limits are also accounted for. There are three different NOFI busters currently available: ocean, harbour and current buster. Busters can be operated either by two vessels or by a single vessel using a boom vane. The correct speed, with consideration of the actual sea state, is vital for a successful operation, and these factors are realistically simulated. Likewise, poor handling of booms results in leakage. Interaction with various objects is modelled as well; for instance, dangerous objects will deflate booms and cause leakage. Vessels can deploy skimmers for oil collection. The behavioural realism is aided by the spill’s visual appearance, which depends on the amount of spilled oil and the type of oil spill. The second part of the solution is the PISCES II crisis management simulator, which includes an oil spill model and enables resource management for command centre personnel. Trainees learn how to handle oil spills according to the OPRC Convention (International Convention on Oil Pollution Preparedness, Response and Co-operation) requirements. The simulator also supports the Preparedness for Response Exercise Program (PREP) administered by the US Coast Guard. The oil spill model is affected by currents and wind. It simulates spreading, evaporation, dispersion, emulsification, viscosity variation and burning. The oil flow distribution is carefully calculated and is affected by vessels, recovery objects and other structures. Realistic exercises can be created easily for both offshore and coastal scenarios.